If you were an early adopter of digital music, starting back in the days of Casady & Greene’s Soundjam on through the birth of iTunes, it’s likely that your iTunes library is untidy at best—stricken with duplicates, mismatched tags, and missing or incorrect album artwork. iTunes is very little help in this regard, offering the most minimal of tools in the form of its Show Duplicates command, a command that separates twins only by track tile and artist. If you have a track that has studio, live, outtake, and remix versions, iTunes is likely to term them all duplicates. And this is not helpful unless you enjoy sifting through long lists of tracks, tossing the few true duplicates. No, for this kind of job and others—correcting ID3 tags and supplying accurate cover art—you need better tools. Better tools such as these. Among the geekier element of Mac iTunes users, Doug Adams is legendary for his Doug’s AppleScripts for iTunes Web site. If something can be done to iTunes or an iPod via AppleScript or Automator, odds are that Doug offers the way. When it comes to locating and weeding out duplicate tracks, Doug has a way to do that as well with his $15 Dupin. 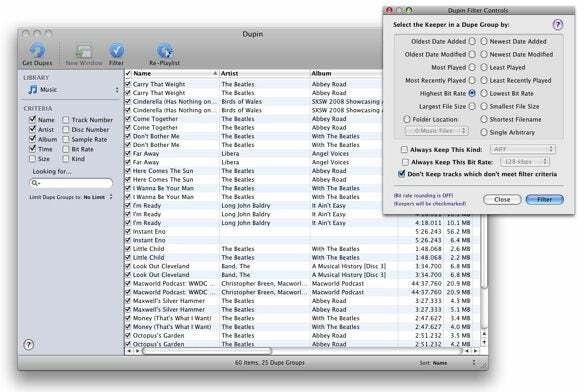 Dupin can filter an iTunes library using an extensive set of criteria including Name, Artist, Album, Time, Size, Track Number, Disk Number, Sample Rate, Bit Rate, and Kind. And once it locates duplicates based on these choices, it provides a variety of ways to determine which tracks to keep—most recently played, highest bit rate, and newest date added, for instance. Unlike iTunes, Dupin can search individual playlists as well as your entire library. New to the program is the ability to consolidate play, skip, and ratings information from the duplicate tracks into the track you intend to keep. 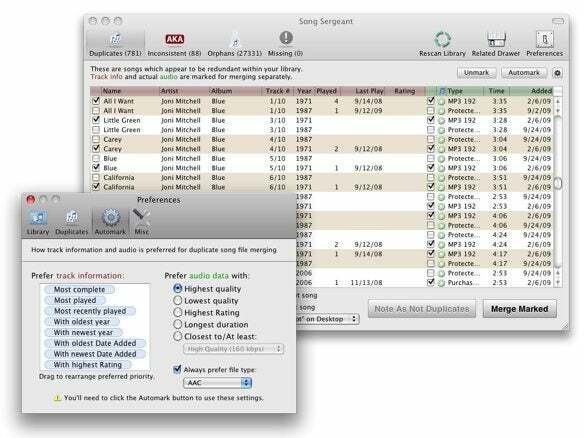 Song Sergeant uses fewer search criteria than Dupin—Track Title, Artist Name, Duration, Album Title, File Kind, and File Size—but the criteria it offers should be enough to locate most—if not all—of your iTunes library's duplicate tracks. Song Sergeant prioritizes tracks in two ways. The first is by their ID3 tags—most complete, most played, most recently played, etc. You also filter audio data by highest quality, lowest quality, highest rating, longest duration, closest to a specific quality, or by a specific file type (AAC, MP3, AIFF, WAV, Apple Lossless, or Protected). When duplicates are identified the program automatically selects tracks based on the filters you’ve set. You’re welcome to choose those that you believe aren’t duplicates and then click Merge Marked to remove the duplicate files. (Duplicate tracks can be sent to the Trash or to a folder you designate.) The “merged” part of this command means that if a duplicate has better tagging than the version you want to keep, that information will be merged with the kept track. The Inconsistent feature helps you assign consistent names to albums and artists—The Rolling Stones versus Rolling Stones, for example. Song Sergeant will offer a preferred name, although you can overrule it. When names are to your liking, click Rename Selected as Preferred. As for orphan files, just choose the ones you want to add to iTunes and click the Add Selected to iTunes button. Select those you don’t want and click Trash Selected. TuneUp Media’s TuneUp (lifetime license, $30; yearly license $20) is an iTunes utility of a different stripe. Rather than looking for duplicate and missing files, it attempts to clean up the tracks you have in your iTunes library by locating and applying the correct tags and album art to them. To start, click the Analyze icon and TuneUp scans your music library and gives you some idea of the shape of its tags—incorrect track artists, track names, album names, genres, year, cover art, and track number. To begin cleaning up your library, select the Clean option and drag up to 500 tracks into the TuneUp window that attaches itself to the right side of the iTunes window. TuneUp connects to the TuneUp server, which uses GraceNotes’ database to analyze and properly tag your tracks, and begins analyzing your music's metadata. Track analysis takes about two-to-three seconds per track. When it finishes analyzing the tracks, the program groups them into three categories, separated by album—Matches (those it's darned sure about), Likely Matches (those it's pretty sure about), and Not Found (it's stumped). You can accept all its changes in a particular category by clicking Save All or save or reject each entry individually. For each album entry you can see which tracks are in your iTunes library (and which are missing) and choose alternate cover art if you feel TuneUp hasn’t picked the right artwork. If you discover that an album is missing tracks, just click the arrow next to a missing track and you’re transported to the iTunes Store where you can preview and purchase the track. Speaking of cover art, TuneUp has a separate function that will look for tracks that are missing artwork. I’ve had mixed luck with this feature. Each year I download multiple gigabytes of SXSW showcased artist tracks and, as many of these bands are obscure, TuneUp’s cover art suggestions are sometimes way off base. Unfortunately there’s no way to tell TuneUp to search just specific playlists for missing artwork (all my not-SXSW tracks, for example). TuneUp also includes a Tuniverse feature that links to related YouTube videos, bios, album recommendations, concert tickets, and merchandise (offered through eBay) for the currently playing artist. And it has a Concerts tab that displays concert dates and venues for artists in your iTunes library who are playing locally during the next couple of months. Each artist name links to JamBase.com, a concert information Web site. Additionally, some listings include direct links to Stubhub and Ticketmaster.